Featured on Project Runway Fashion Startup! You come from a family of doctors and engineers, what lead you to sanitation? Coming from a family of doctors and engineers, I was encouraged to think analytically. One thing that medicine, engineering, and yes, waste, have in common is the study of a comprehensive system. In medicine, for example, it’s the body, and in waste it’s logistics of the movement of material. Outside of my family’s professional pursuits, I grew up camping and backpacking in the Southwest. Spending summers outside, hiking and canoeing, really instilled a sense of respect for the natural world, its resources, and how it too functions as a system. Interestingly, we didn’t recycle growing up. However, there were plenty of lessons about reducing waste. There is a phrase in the backpacking world, “pack it in, pack it out”, meaning any trash you create has to leave the trail with you. When you have to collect all the trash you produce in a bag and carry it with you for a couple days, you pay more attention to how you could create less. My family lived outside of city limits, so we didn’t receive curbside, municipal trash service. Instead, every other weekend my dad packed our trash into the back of his pickup and my sister and I rode in the backseat to the local waste transfer station. We watched him throw bag after bag into the “dump” and pay for each one. (I actually still find a lot of value in the pay-as-you-throw philosophy.) I think the sum of these experiences informed a general sense of environmental responsibility, which finally found a focus when I was in college. I was in a biological issues course, once class of which addressed sustainability. The professor only briefly explained climate change, but I was hooked! At one point he said “scientists find and have answers, but they are terrible communicators” and I thought – that’s where I want to help. I immediately added a second major, in education, so I could study how complex, technical, and mostly abstract topics could be translated into ideas easily internalized and understood by anyone, without losing the deeper meaning. I continued to study this in grad school, where I received a Master’s degree in Climate and Society. One of my professors also worked at the Department of Sanitation, and applied to be her intern at the Department in the Bureau of Waste Prevention, Recycling and Reuse. That summer I helped launch the re-fashioNYC program, and was then hired full-time to run the program. How did you get from sanitation to fashion? While managing the re-fashioNYC program, and later piloting the curbside collection of clothing, I was essentially working on everything that happens after fashion. I learned that clothing, accessories, and linens makeup 6% of New York City’s waste stream – that’s 200,000 tons thrown away every year! To put that in context, that’s 14 times the weight of the Brooklyn Bridge. Every year! It’s hard to ignore. As I started working more closely with the local non-profits, I started to form a full picture of what happens to all the clothing we no longer want. I was also introduced to some proactive brands who also recognized the problem and wanted to find a way to address it. Why is it important to keep textiles out of the landfill? There’s social, economic, and environmental reasons. If the clothing headed to the landfill was donated instead, it becomes a resource for a non-profit organization. They may be able to sell it locally in thrift stores or in bulk to raggers and recyclers, using the money they make to support their charitable mission. When clothing is thrown out, it costs the Department of Sanitation millions of dollars to pick it up and transport it to landfill. Since Freshkills Landfill was closed in 2001, New Yorkers’ waste travels to landfills other states. This is paid for by our tax dollars! I think we sometimes forget the cost of “throwing things away” when it’s just included in our taxes and Sanitation is so efficient at making the bags at the curb disappear. Clothing in the landfill is problematic as well. When disposed in landfill, the dyes and chemicals in fabrics can leach into the soil, contaminating local water systems. As clothing decomposes, it releases methane and CO2, both powerful greenhouse gasses. Most people don’t know about the problems with pre-consumer waste. Can you describe the scale of the problem? Let’s clarify the difference between pre-consumer and post-consumer textile waste. Post-consumer, or residential waste, is what is created by individuals or families when they no longer want their garments or linens. It’s textile material that has been used and discarded. Pre-consumer, or commercial waste, is what is created by businesses as they make their products. It’s textile material that is left over from the design or manufacturing processes. For example, fabric headers, cutting room scraps, garment mock-ups, mutilated items, and deadstock bolts of fabric are all part of the commercial textile waste stream. It’s really hard to quantify the amount of pre-consumer textile waste created. In New York City, there are numerous waste haulers that serve businesses, and there are few, if any, reporting requirements. The most relevant estimate that I’ve found is in the book The Story of Stuff, by Annie Leonard, which marks commercial waste as at least FORTY times residential waste. Though it’s impossible to know if textiles make up the same percentage of commercial waste, using just NYC’s textile numbers, that would be 8 million tons of commercial waste from the production of clothing, accessories, and linens. Again, every year! When you were working on re-fashioNYC you noticed there were some challenges and limitations to the program. How did this discovery lead to FABSCRAP? 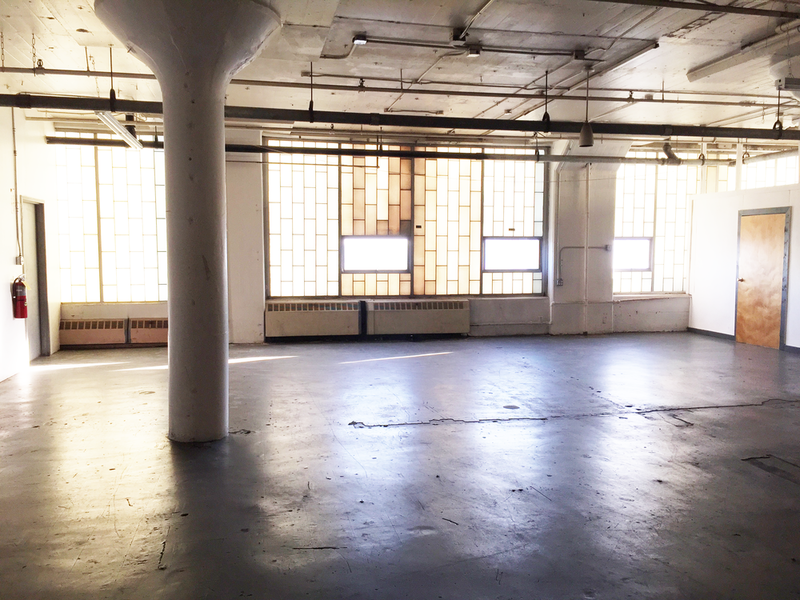 As the re-fashioNYC program grew, a few companies expressed interest in using the program for their textile waste, or looking for any other donation option. Unfortunately, the typical non-profit is not set up to sort commercial textile waste, and the volume created by most designers would quickly overwhelm arts organizations. The re-fashioNYC program installs large donation bins in apartment buildings. In NYC, that space is valuable! Some buildings also had concerns about the bin clashing with their interior aesthetics. I figured that fashion companies would likely have the same issues – if I was going to make recycling textiles easy for them, it couldn’t take up a lot of space and it couldn’t compete with their brand. How does FABSCRAP work? 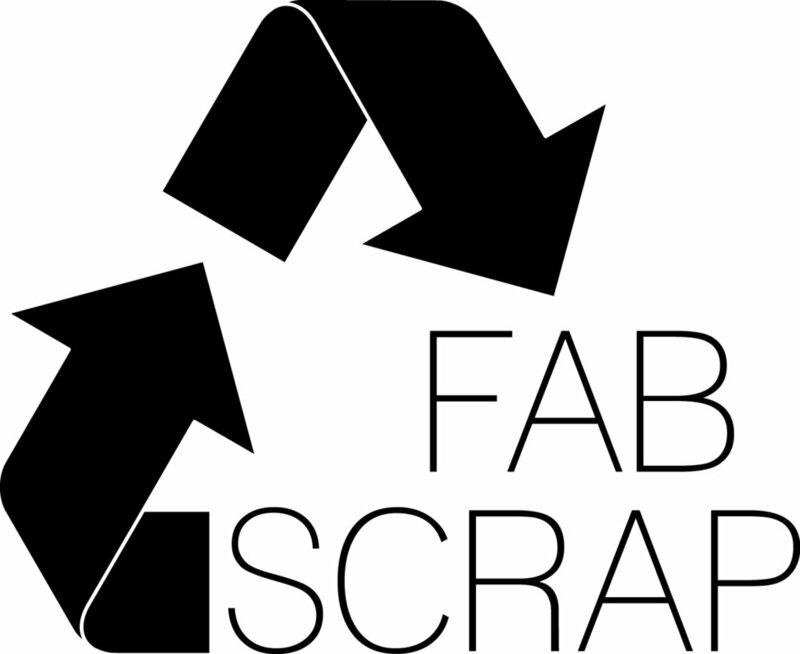 FABSCRAP is a textile recycling service for any business with textile waste. We provide reusable bags in two colors: black and beige. Black bags are for any material with proprietary patterns, designs, or logos, and beige bags are for everything else. When the bags are full, you simply call or email to schedule a convenient time for us to come pick them up. You don’t need to remove headers, pins, zippers, buttons, stickers, tape, etc., we’ll remove everything from the fabrics as it's sorted. We’re keeping textile from the landfill in two ways – recycling and reuse. Most fabric will become a mixed fiber padding used insulation, carpet padding, moving blankets, or furniture lining. Fabric that is 100% cotton, wool, or polyester is able to be truly recycled into new cotton, wool, or polyester fibers! The larger pieces that we receive can be used by local artists, smaller designers, and students who may want to incorporate a sustainable element in their work. There is a service fee for pickup of the fabric scraps, but as FABSCRAP becomes a non-profit the fee will be tax-deductible. Anyone who volunteers to help sort the incoming scraps, may keep the fabrics they like as they sort! As a startup what are some of the challenges that you face? Starting a new business is simultaneously the most challenging and most rewarding thing I’ve ever done. It’s so great and so hard to be your own boss! Thankfully I can make use of a lot of my waste management experience, but I’m still learning the business world and fashion industry. It’s two new cultures and vocabularies. What they say is true – everything costs more and takes longer than you think. Talk to us about standards and the sharing of information in the fashion industry? How does this affect your work with FABSCRAP? I was really intimidated by the fashion world! From the outside, it seemed pretty judgmental and competitive. However, I’ve been overwhelmed by how encouraging, open, and supportive people have been. It probably helps that I’m working in the sustainable fashion realm, and everyone can connect on the common goal of wanting to improve the industry. I think it’s easier for individuals to share resources, updates, contacts, and new developments. I’m working with quite a few brands now, and it’s interesting to see what is and is not shared at that level. It can be a big decision to publicly share sustainability initiatives, even if they are happening internally. 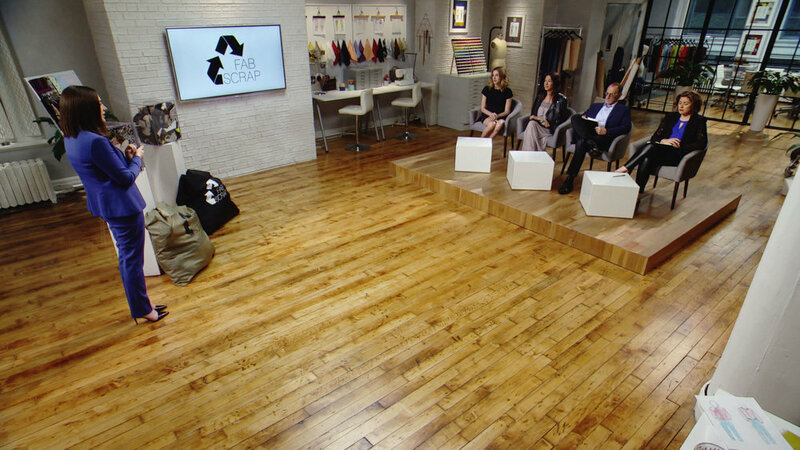 How did you end up on Project Runway Fashion Startup? When I was first working out how FABSCRAP might become a business, I only told one or two friends about it. It happens that one of those friends knew someone working on a new show that would be "like Shark Tank for fashion companies". I went through the interview and application process, and then we filmed just a couple months later! Such a crazy experience. What can you tell us about your experience on the show? They only show about five minutes of my pitch and the investors asking questions, but I was in front of them for nearly an hour! They want real answers and are taking the investments seriously. That hour seems like a year though! They had to pause filming half way through to fix my "shine" because I was sweating so much! It's a really intense process, but I think the feedback and questions were extremely valuable and it made my business better. I'm thrilled to have three new board members so that I can continue to use their expertise! Tell us about fiber contents and implications for the waste stream. I think it would be more beneficial to talk about the unused fabric as a resource stream as opposed to waste – because they definitely still have value! It’s great when we receive fabrics that are 100% cotton or 100% polyester. Like I described above, new technologies are making it possible to completely recycle these fibers. But, obviously, most fabric is a blend of few or many fibers. The most troublesome fibers, at least for now, are Spandex, elastane, and Lycra. These fibers melt when shredded, so they cannot be recycled. With the rise of the popularity of athleisure and stretch, less fabric and clothing can be recycled. What’s most important, and this is true of any commodity, is to maintain the markets that make recycling possible by buying goods with recycled content. What do you see as the current and future potential of the Interface between industry and government regulation? In New York City, if 10% or more of your business waste is textile material, you’re already required by law to recycle it. The problem is that there is very little enforcement of that law or infrastructure in place for businesses to comply. Hopefully FABSCRAP helps! If the new legislation banning e-waste from landfill is any indication of what’s ahead for textiles, Extended Producer Responsibility laws could be on the horizon. This could potentially force the industry to be more accountable for both pre- and post-consumer textile waste. What is the relationship between waste streams and new technology? As we already mentioned, new recycling technologies for specific fibers are a good step towards bringing us closer to closing the loop for textiles. However, if I could speed any advancement in the field of textile reuse and recycling, it would be mechanized sorting. In both pre- and post-consumer textile streams, all sorting is currently done by hand. A person must pick up and inspect each item! It’s the most inefficient and imprecise part of the entire process. Even though the pre- and post-consumer streams are sorted differently (pre-consumer waste is sorted primarily by size and fiber content, while post-consumer is sorted for resale potential by quality, season, or item type), the mechanization of any part in either process could be beneficial to both. Where does your deepest passion lie in this pursuit of sustainability? My favorite quote is “Even if I knew that tomorrow the world would go to pieces, I would still plant my apple tree.” I think that pretty much sums up how I feel about sustainability. It’s an overwhelming endeavor, but everyone can do something to now to address it. It’s easy to get discouraged, but I try to remain positive and act now, with hope. Jessica has just moved into her new warehouse and she is welcoming volunteers to help sort material. The best part is anyone who volunteers can keep whatever fabric they like! For more information please contact Jessica though her website.